The Helen E. Copeland Gallery and the School of Art at Montana State University are pleased to announce the Master of Fine Art’s thesis exhibition of Alyssa Riann Willard, Perceptual Interference. 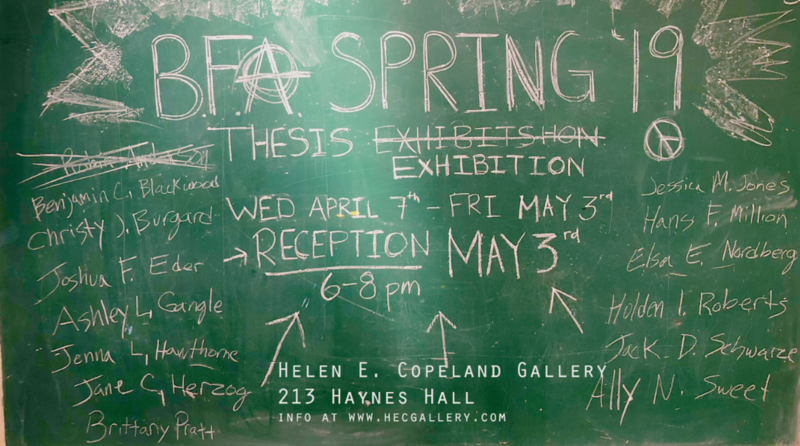 The exhibition will take place at the Helen E. Copeland Gallery in Haynes Hall on the Montana State University campus in Bozeman, Montana, Monday, March 25th- Friday, March 29th, 2019 from 9:00 am- 5:00 pm. Willard’s thesis defense will take place March 25th at 11am – 12pm in the gallery. There will be a reception for Perceptual Interference on Thursday March 28th, 2019 from 6:00 – 8:00 pm. All events are open to the public. Alyssa Willard received her B.F.A. from Central Washington University in 2015 and has exhibited regionally and nationally during the last decade. She recently engaged in the first collaborative creative project on MSU campus between the Physics Department and the School of Art, which resulted in her winning first prize and the offer in fall 2018 to be the first ever Artist in Residence in Physics. The painting that won her the residency will be on public display in Montana State University’s Barnard Hall for three years. Her yearlong residency will conclude with an exhibition of work in Barnard Hall, run concurrently with Perceptual Interference.